Want to know how Kwheezy stacks up against the other "unknown" distros of 2013? Click here to find out! 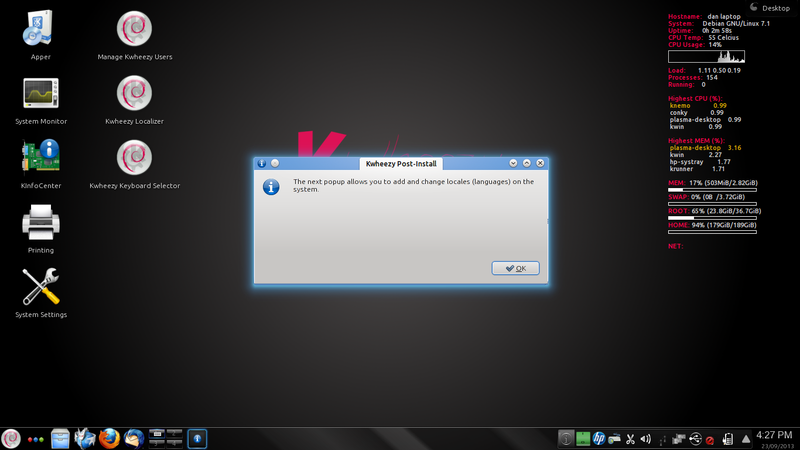 I have always been a categorically against the KDE desktop experience. I've never understood it, and never really tried. Part of that might be because I started with GNOME, I don't know. What I do know for certain is that I have always shied away from KDE desktops and therefore I have avoided many distributions. Something about Kwheezy however, has intrigue me enough to make me want to take a look. I have many presuppositions that will have to be overturned in order to be unbiased, but I am willing to give it a very good try. Whether you are a fan or foe of KDE, put some of your biases aside and join me for this review. The website says the following: "Kwheezy is Debian 7 (Wheezy), with a pre-configured KDE desktop experience and a good selection of GNU/Linux/Open Source software." That is an understatement! It doesn't come with a good selection of software, it comes with all of the you need to get started. The page goes on to say that it's not really a separate distro, but more of a pre-configured Debian installation. In order to conduct this review, I used both my MacBook Pro with a 2.5 GHz i5 processor and 4GB of RAM via VirtualBox (of which 1GB of RAM was utilized), and my two-year-old Toshiba laptop with a Celeron processor and 3GB of RAM. Kwhhezy's 1.2 ISO weighs in at a hefty 3.8GB. It was easy enough to get to. The website directs you to Linux Freedom. Simply scroll down until you see the US mirror for the 64-bit, or 32 bit if that's what you need, and click. 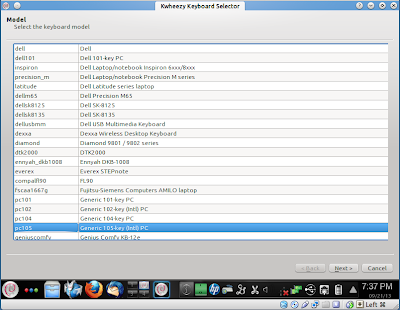 Kwheezy 1.2 comes standard with a slew of programs, which explains its giant ISO. One of the major categories is games. Major categories include arcade, board games, card games, and tactics and strategy, along with Stream, which you can access by inputting your Stream login and password. For office needs it comes complete with LibreOffice suite which is comparable to Microsoft office as well as several utilities such as the HP fax utility and Calligra Flow, which is a flowchart and diagram program. I also found it mildly surprising, but refreshing, to see VirtualBox, Unetbootin, and WINE configuration available. Like I said, it's huge, because it just about everything you want. The live CD desktop looks beautiful! 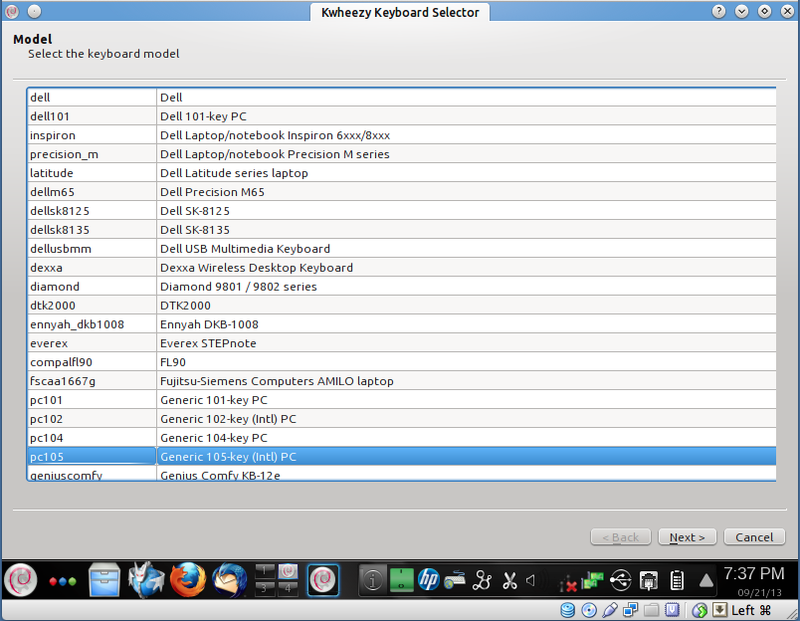 Immediately after booting a live CD version of Kwheezy 1.2 into my VirtualBox, I was asked to set up my keyboard. This was an interesting but unnecessary step, as canceling the process did not affect my user experience. In hindsight, I may not of allocated enough RAM to the distro as it used half of the allocated 1 GB for resting alone. This is not a real dilemma for someone who has several gigabyte available. However, it could become a problem for someone on an older computer that does not have as much RAM available. I fired up the Google search engine and search for Kwheezy. My resource usage immediately jumped to 60% of RAM and the distro began to drag. When testing it on my dedicated Toshiba laptop, the resource issues usage stay the same, but of course that meant better overall percentages because I had more RAM allocated to it. CPU usage sits around 8 to 10% at rest on my Celeron based Toshiba laptop and jumps periodically depending on the task. Overall, despite the higher use of RAM, the distro makes efficient use of my technological resources. On my Toshiba, using the lives CD at first, it had no trouble figuring out my wireless system and after I put in the pass code, I was on the Internet without a hitch. All programs on the live CD work without any modification. Installation onto my hard drive was a breeze! I had to input information into four screens, and then KWheezy did the rest. It didn't do the best job of explaining my need for passwords for both the route and administrator. While I assumed that's what it was, it wasn't until after I messed up my password that I learned for sure. While it was a breeze, they did take a while as you used almost all of my CPU for the entire download process, meaning that it was at 100% for almost the entire process. It also required more than 1GB of RAM, meaning that I would not have been able to install it on my VirtualBox on the MacBook Pro without reconfiguring VirtualBox.That small hiccup aside, I am now running KWheezy on my hard drive without any problems at all. KWheezy was a breeze to install! The installed version is very clean, but does run you through a short setup. The good: first of all, it comes with everything you need right out-of-the-box. Aside from getting my Bible software downloaded, which is necessary for me because of what I do as a lay minister, KWheezy comes with everything I needed. I didn't have to go get an office suite, games, or anything else. As I get used to it, I may go get things such as Supertuxkart or other games that I want to enjoy, but I did not need anything to begin working from the distro. This is especially important because the computer serves as the extra family machine, meaning that my children need to be able to use it. My daughter had no problem learning how to use the system once I showed her the few nuances it had. Of course this is my gold standard for Linux distros. If my kids can use it, anyone can. The bad: Trading immediate usability for size, the distro is very big. I had to set aside my 2 GB thumb drive for the heavier 8 GB thumb drive in order to build the live CD version. Whether this is truly bad or not is subject to personal situation and up for debate. Again, that big distro allowed me to use the desktop out of the box, or thumb drive as it were, without any modification. Still, for those who don't have quite the amount of resources, it is something that must be understood. Final thoughts: Despite my initial misgivings about KWheezy because it is a KDE desktop, I came away from reviewing this distro very impressed. It truly came with everything I needed and much much more! It does chew on resources at times, but as long as you have more than two gig of RAM and a decent processor you'll be fine. I particularly enjoyed it is easy to start using both as a live CD, and as an installed distro. I highly recommend the distro for your personal review and use. Let me know what you think of it! This has got to be the largest Distro I have ever downloaded, it was even bigger than a "Full Knoppix DVD" -by just a tad. I also installed the latest amd-catalyst drivers 13.8-Beta with absolute ease on this Debian 7.1 / KDE beast. wow, in the past I could never do this on the *Buntu's without trashing them. The only caveat I found, in my particular systems was with "pulseaudio". I has to "purge" pulseaudio, re-install ALSA, and voila, volume-icon, and mmixers came back, and of course my sound was all there. I forgot just how stable and "clean" a pure Debian 7.1 really is. and KDE, I luv it in this. - It really is the "Cadillac" of Linux DE's, hands down. ...and thanks very much for your review, it is one of the reasons I wanted to try/install this. Thank you for the compliment! I appreciate it very much. I do not worry about the audio function, and is I rarely use it outside of what my daughter needs for YouTube videos. For that, it worked fine. I was extremely pleased and impressed with how clean it really was. There were virtually zero issues with my install. And, KDE performed better than I expected. Thanks again for stopping by the blog! I hope that you will contribute in the future. This distro has some good future ahed, based in Debian 7.1, stable and very well tested base; also, like some other users I'm really tired of Gnome desktop that is estehically not appealing, so KDE is a welcomed option; for now I'm using Clementine internet radio app with so many fine radio stations, awesome. I think there will be a new upgrade 1.3 coming soon. Nice review. You didnt let your previous dislike of KDE get the better of you. As a rampant Distro hopper, this one has stopped me in my tracks. It simply works. I look forward to reading more reviews from you. This was my first. I just saw that 1.3 is out! I plan on looking it over soon. Might update the blog or write a new post. I have a new review in the hopper...hope you get to see it soon!